"Life moves pretty fast," as a famous teenage philosopher once said, and before you know it, a quarter-century has gone by. It's hard to believe it's been 25 years since the release of 'Ferris Bueller's Day Off' (on June 11, 1986). Though dated in some ways (there's a lot that clearly marks it as a product of the '80s), the movie feels as fresh as ever, thanks to the eternal exuberance of Matthew Broderick in the title role and the ability to accurately evoke timeless teenage concerns that was writer/director John Hughes' trademark. And time certainly hasn't diminished the movie's impact, which continues to be felt to this day. Here are some of the ways 'Ferris Bueller' has influenced pop culture -- not just movies, but also TV, music and beyond. 'Ferris Bueller' earned $70.1 million, making it the 10th biggest hit of 1986. It cemented the reputations of teen star Broderick (famous since 1983's 'WarGames') and teen-life comic auteur Hughes (who had already released 'Sixteen Candles,' 'The Breakfast Club' and 'Pretty in Pink'). It was actually the last teen movie Hughes would direct (he wrote one more, 'Some Kind of Wonderful,' which was essentially a rewrite of 'Pretty in Pink' with the sexes reversed); after 'Ferris,' he turned to writing comedies about clueless adults ('Planes, Trains and Automobiles,' which featured another memorable role for 'Ferris' co-star Edie McClurg) or very small children ('Home Alone,' 'Baby's Day Out,' which were largely 'Ferris' rewrites with much younger protagonists). 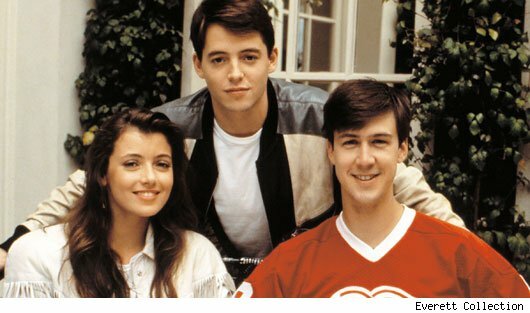 Still, 'Ferris' made a big impression on young, aspiring filmmakers who saw it. Kevin Smith's movies have numerous references to 'Ferris,' and his Jay and Silent Bob characters frequently break the fourth wall to address or wink at the audience, à la Ferris. Jason Reitman, who would grow up to make 'Juno' (featuring perhaps the smartest-talking screen teen since Ferris) and 'Up in the Air,' has said that seeing 'Ferris' changed his life. 'Ferris' made stars out of most of its cast. 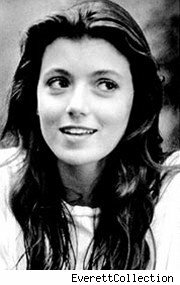 Mia Sara, who played Ferris' girlfriend, Sloane, enjoyed a run, however brief, as a leading lady in movies and TV miniseries. 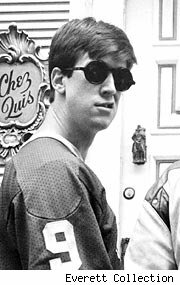 Alan Ruck (glum pal Cameron), who cited it as the best movie role he's ever had, went on to a successful run on TV's 'Spin City.' Jeffrey Jones and McClurg have enjoyed long careers as character actors, but both are best remembered for their roles as vengeful principal Rooney and his bubble-haired secretary, Grace. And Matthew Broderick? As he noted during his tribute to Hughes at the 2010 Oscars, "For the past 25 years, nearly every day someone comes up to me, taps me on the shoulder and says, 'Hey, Ferris, is this your day off?'" For all his career success in movies and on Broadway over the last 25 years, Ferris remains his signature role. He seems a little irritated by that notion, as if fans won't let him move on, but he's also used it to his advantage. Fans' fondness for Ferris is what made Broderick's shocking performance as an embittered high school teacher in 1999's 'Election' work. 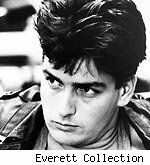 To see a gone-to-seed Broderick scrambling to crush irrepressible student Reese Witherspoon's perky ambitions is to realize with horror that Ferris Bueller has grown up to become Mr. Rooney. Even Ben Stein, playing a droning economics teacher who didn't even have a name, turned his brief 'Ferris Bueller' appearance into a career. His flat, dull voice and know-it-all manner made him an in-demand comic actor, commercial spokesman, even game show host ('Win Ben Stein's Money,' in which he matched wits with contestants over trivia challenges). He'd been a speechwriter for Presidents Richard Nixon and Gerald Ford, but still, he owes his prominence as an economic pundit to the fact that he played one in a teen movie. Ben Stein's career wasn't the only incidence of 'Ferris Bueller''s impact on the small screen. There were some direct attempts to duplicate the film's success by converting it into a sitcom. One was NBC's 'Ferris Bueller,' which starred Charlie Schlatter (later of 'Diagnosis Murder') as Ferris and an unknown named Jennifer Aniston as Jeanie; the other, a knockoff called 'Parker Lewis Can't Lose,' aired on Fox and starred Corin Nemec. Both shows debuted in 1990. Curiously, the 'Ferris' show was canceled due to low ratings after 13 episodes, while the ersatz Ferris on Fox lasted three seasons. The movie's frequent breaking of the fourth wall wasn't new to TV (George Burns had done it for years in his 1950s sitcom), but it became an increasingly popular device after Hughes and 'Ferris' popularized it. The smart-alecky teen leads on 'The Fresh Prince of Bel-Air' and 'Malcolm in the Middle' frequently turned aside to address the viewers. The parade scene's use of 'Danke Schoen' introduced a whole new generation to Wayne Newton, and it sent the Beatles' 23-year-old recording of 'Twist and Shout' rocketing back up the singles chart. Years later, alt-rockers Save Ferris and Rooney would take their band names from the movie. The film's most lasting musical legacy, though, was popularizing Swiss band Yello's song "Oh Yeah." Played while the camera lingers lovingly over Cameron's dad's Ferrari, the song started popping up in other movies and TV shows and turned into a sonic cliché, quick shorthand for the on-screen introduction of a drool-worthy hot car or hot babe. In 1990, First Lady Barbara Bush quoted Ferris's "Life moves pretty fast" epigram during a college commencement speech. 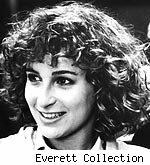 (Her husband's vice president, Dan Quayle, cited 'Ferris' as his favorite movie.) Stein's "Bueller ... Bueller ..." and "Anyone? ... Anyone? ..." became popular catchphrases. Why does everyone want to be Ferris, or at least befriend him? It's that urge to enjoy life's pleasures and experience freedom, as Stein has noted in the DVD commentary. That's why the film will live forever, he says. "We want to be free. We want to have a good time. We know we're not going to be able to all our lives. We know we're going to have to buckle down and work. We know we're going to have to eventually become family men and women, and have responsibilities and pay our bills. But just give us a couple of good days that we can look back on." Follow Gary Susman on Twitter: @garysusman. am gοing to delivеr in collegе. I'm wondering why the opposite experts of this sector do not notice this. You should proceed your writing. I'm confіdеnt, you've a huge readers' base alreаdy!